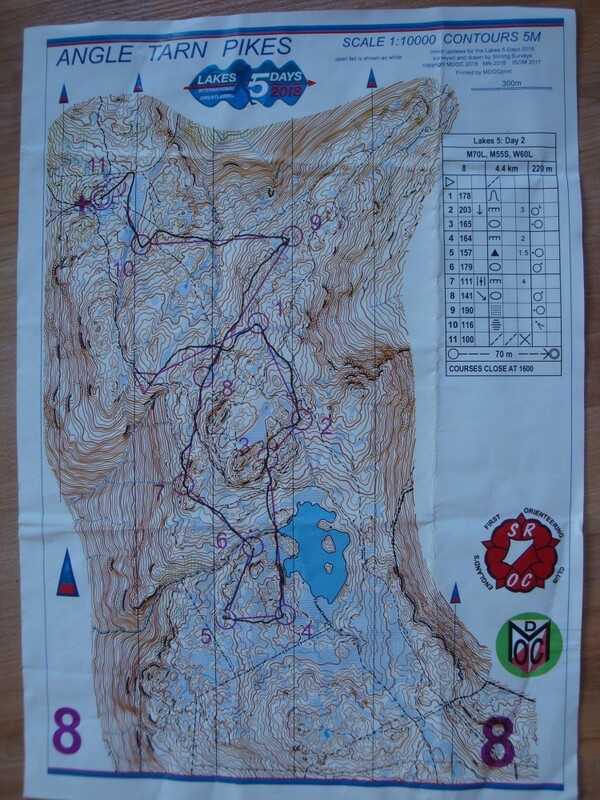 Two weeks ago, a few families and individuals from EckO spent a week down in the Lake District competing in the Lakes 5 days 2018 Orienteering Competition. 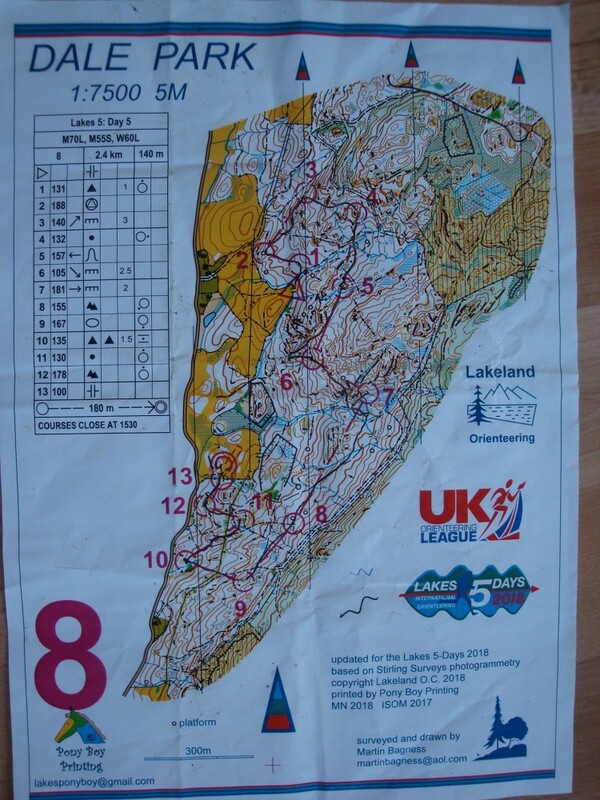 Two weeks ago, a few families and individuals from EckO spent a week down in the Lake District competing in the Lakes 5 days 2018 Orienteering Competition. This event is held every four years, alternating with events like the Scottish 6 Days, the Southern Lakes and the Welsh equivalent. There were almost 2,000 competitiors and 24 countries were represented. The competition areas were very varied, as was the weather. 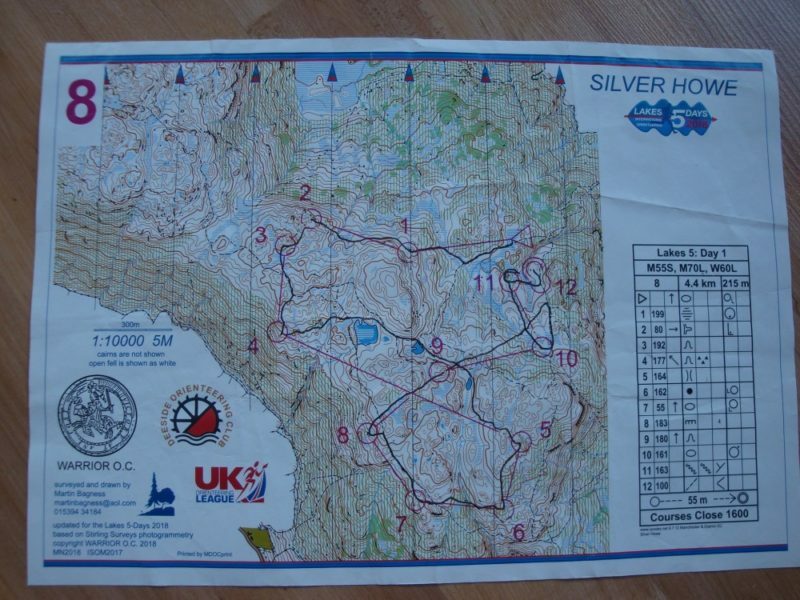 The races were held at Silver How near Ambleside, Angle Tarn Pikes near Ullswater, Whinlatter near Cockermouth, Askham Fell near Pooley Bridge and finally Dale Park near Newby Bridge. 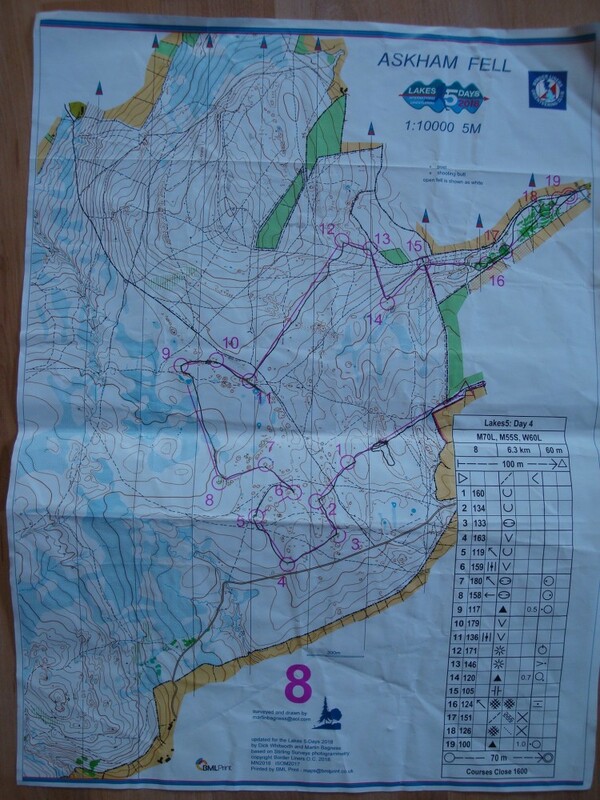 Some of the starts included a 2.4km walk in with 240 metres of climb! Not bad for a warm-up. Other starts were slightly more civilised. We had a fair mixture of weather, it’s fair to say, with heavy rain on Day 1 at Silver How leading to poor visibility up on the fell. However, both Carol and I felt that it was “strangely enjoyable”! I think the very fact that we managed to get up and down safely and complete the course competently led to a certain amount of smugness and satisfaction. My overriding memory has to be sharing the canopy of a juniper bush with Carol up on top of the fell, trying to keep as dry as possible, waiting for our starts, as we had misjudged how long it would take us to walk up. The MacMillans did particularly well during the week with Jura coming 3rd in W18L, Louis 5th in M18L, Susannah 5th in W45L, Iris 11th in W14A and Gordon averaging 17th on Light Green. 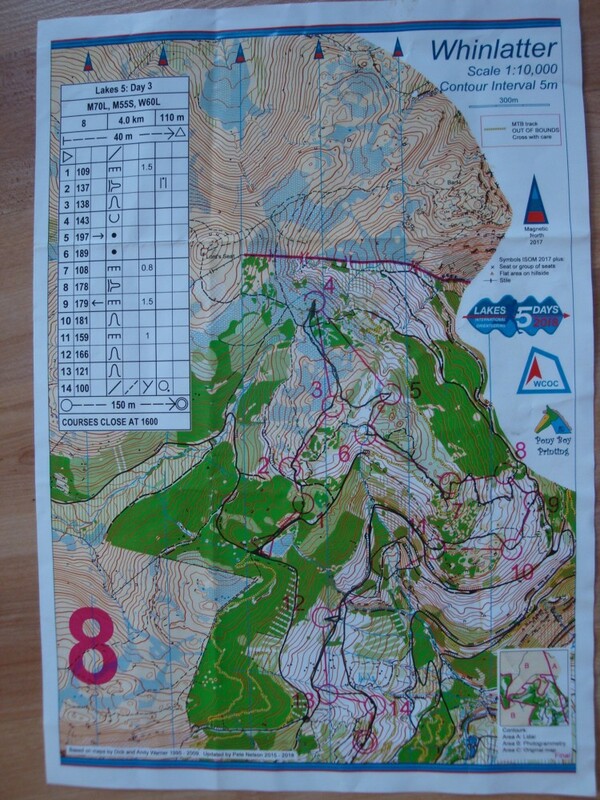 Carol, Jan and Andrea all had their own personal challenges and experienced lots of highs and some lows during the week but generally came away feeling very satisfied with another five days of orienteering under the belt. Carol was 10th in W50S, Andrea was 14th in W50S and Jan was 14th in W60L. The Mailers said, “ they enjoyed the variety of terrain - from the mountain (poor visibility) navigation to the steep forestry and open fell. (Sorry we missed the last day). 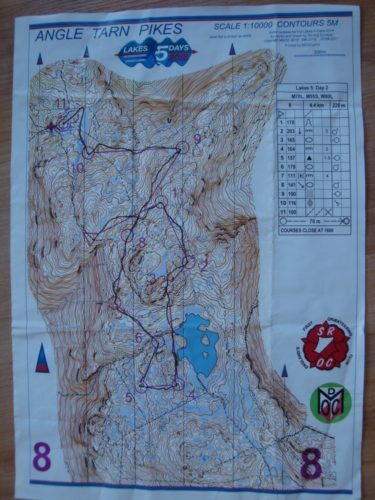 They found the courses quite challenging, the event well organised and the folk friendly and they would definitely go back again”. It was great to see EckO well represented and if you feel you would like to branch out from our local events, either as a family or as an individual but feel a little unsure about how you would go about entering, why not come to our social at the end of August (see website for further details) and speak to any of the “old hands” who would be only to willing to share their wealth of knowledge and experience.